Walk-in access to Sand Harbor is not allowed - Since 2012, walk-in access to Sand Harbor is no longer allowed. The primary reason cited for this change in policy is safety. Due to Sand Harbor's popularity, the park's parking lot frequently fills early during the summer months (see section below about parking). People had then been parking along Highway 28 and walking along the narrow roadway to enter the park. There are no sidewalks and summer traffic is heavy, making the trek hazardous for both pedestrians and motorists. Drop-offs and parking are illegal along the highway at Sand Harbor. The no parking zone runs 3/4 of a mile in both directions from the Sand Harbor's main entrance. Those who ignore this zone will be cited. When the parking lot is full, visitors must take the East Shore Express shuttle from Incline Village to enter the park. The shuttle will run on weekends only from May 31 through June 29, then daily from June 30 through September 1, 2014. Hours of operation are every 20 minutes from 10 a.m. to 8 p.m. The cost is $3.00 per person and $1.50 for children 12 and under, seniors, and disabled. The fare includes admission to Sand Harbor. Should you get a parking place at Sand Harbor, the fee is $10 per vehicle for Nevada residents and $12 for out-of-state visitors. The Incline Village pickup location is at the old elementary school on the corner of Tahoe and Southwood Boulevards. Free parking is available. At Sand Harbor, the bus drops passengers at the Visitor's Center near the main beach. The Regional Transportation Commission (RTC) will run a weekend route from Reno/Sparks (Outlets at Sparks) to Sand Harbor. Even though Lake Tahoe Nevada State Park is administered as a single unit of the park system, it encompasses three recreational areas that are quite different from each other - Sand Harbor, the Spooner Backcountry, and Cave Rock. Taken together, they make Lake Tahoe Nevada State Park, one of the most unique and diverse among Nevada's 23 state parks. Sand Harbor has a fascinating history, dating back to when Native Americans made use of the rich resources in the area. After the white man came, Sand Harbor was put to various uses and passed through the hands of several owners. The State of Nevada finally acquired some 5,000 acres and Lake Tahoe Nevada State Park opened in 1971. Visitor Information: Sand Harbor offers a number of family-friendly recreational activities, including the swimming beach, a boat launch, picnicking, group use areas, hiking, watercraft rentals and tours, and restrooms. The Sand Harbor visitor center has a gift shop, area information, and displays about Lake Tahoe. During the summer months, there is a food concession, snack bar, and shaded seating area. There is no camping at Sand Harbor or any other beaches within the park. Pets are not allowed in this 55 acre unit of Lake Tahoe Nevada State Park and glass containers are prohibited on the beaches. There is an entrance fee at Sand Harbor - $12 from April 15 through October 15, and $7 from October 16 through April 14. There is a $2 discount for Nevada residents. Fees are subject to change, so check the Nevada State Parks Fee Schedule for the latest information. Sand Harbor Visitor Center: The Sand Harbor visitor center features a gift shop, informative displays, and information about the area. There is a snack bar and grill with food and drinks, and a shady deck for dining and relaxing. 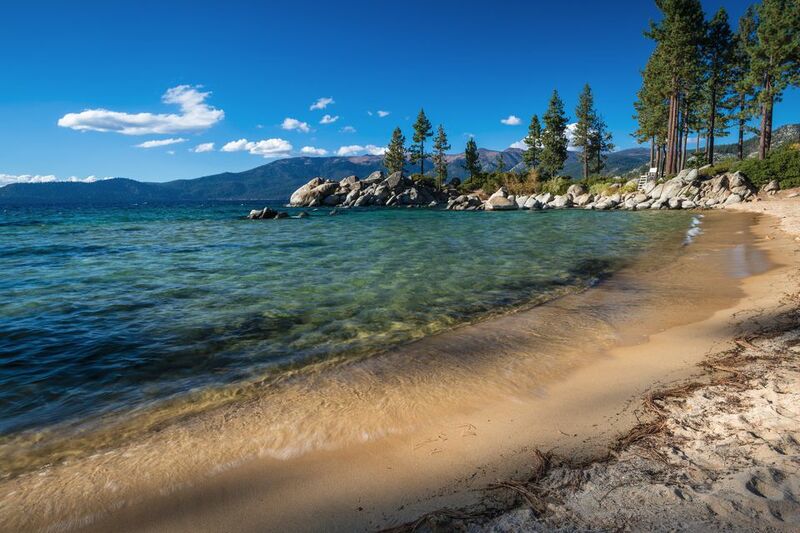 Swimming Beaches: Sand Harbor's beaches are among the nicest on the entire Lake Tahoe shoreline. The main beach area is a long, southwest facing crescent of sand with plenty of family space. The water is shallow and clear, making it a great place to let the kids play and safely enjoy a day at the beach. There are other, more secluded beaches around Memorial Point, though these are more of a walk from the parking area. There is a beach patrol on duty from Memorial Day through Labor Day. Hiking Trails: There are two developed trails at Sand Harbor. The Sand Harbor to Memorial Point Trail takes hikers out to Memorial Point and accesses other beaches and coves. Sand Point Nature Trail has interpretive signs, takes you to outstanding views of Lake Tahoe, and is handicap accessible. Group Area: The group area can accommodate up to 100 people. It offers a covered gathering area with electricity, tables, running water, and a big barbecue. The group area is available by reservation only. You can call (775) 831-0494 for more information and to make reservations. Download the group area reservation form and fill it out ahead of time so you're ready when calling or making a reservation in person. Boat Launch: The boat launch facility has two ramps, docks, and a parking area. All boats must be inspected before launching to ensure that they are not infested with invasive species such as Zebra and Quagga mussels. Be sure to read about boat inspection and launch regulations so you know what to expect. The Lake Tahoe Nevada State Park website advises that boat launch parking fills early on summer weekends. The boat launch facility is open from 6 a.m. to 8 p.m. during the summer season (May 1 through September 30). During winter (October 1 through April 30), it is available from 6 a.m. to 2 p.m. on Fridays, Saturdays, and Sundays only. Operations are dependent on the weather and hours may change or the facility could temporarily close due to adverse conditions. Sand Harbor Rentals: Sand Harbor Rentals is a private concessionaire that sets up shop under a white tent by the boat launch area. Available rentals include single and tandem kayaks, stand up paddleboards, and personal sailboats. They also offer guided kayak tours and paddleboard lessons. Because Sand Harbor is so busy during the summer, reservations are highly recommended for Sand Harbor Rentals services. Same-day phone reservations are not accepted, but you may get lucky by just showing up. To do so, get out your credit card and call (530) 581-4336. Sand Harbor's popularity creates the biggest hassle - parking. According to the park's website, parking lots are frequently full from 11 a.m. to 4 p.m. on summer weekends and during weekdays in July and August. The parking fee is $10 for Nevada residents, $12 for non-residents. There is precious little shade at Sand Harbor and Lake Tahoe sits at 6200 feet. The sun is fierce at that elevation and you will roast quickly without lots of sunscreen or clothing to cover bare skin. Be sure to watch kids closely while they play by the water. There are no sudden dropoffs, but Lake Tahoe is always cold and can lead to hypothermia if people stay in too long. From Reno, take either U.S. 395 or S. Virginia Street to the Mt. Rose Highway (Nevada 431) and follow the signs to Lake Tahoe and Incline Village. When you reach Nevada 28, turn left toward Incline Village. Sand Harbor is located three miles south of Incline Village on the right (Lake Tahoe side). Sand Harbor is the site of the annual Lake Tahoe Shakespeare Festival during July and August. This has got to be one of the most beautiful venues in the world for such performances. Lake Tahoe Shakespeare Festival plays and other activities mostly take place in the evening so as not to creat a conflict with the day use crowds at Sand Harbor. Lake Tahoe Nevada is only one of Nevada's great state parks. Check out the Map of State Parks page to see where more parks are throughout the Silver State. You can also visit the Nevada State Parks Facebook page to get additional information.